Over the past 1.5 years I’ve been using a HP Compaq NC6320, but recently I switched to a Lenovo X60 tablet as my primary notebook. I will provide some arguments for my choice and interesting facts about the device. After 1,5 years the HP/Compaq NC6320 is technically still a very robust and rock solid device. Windows Vista Ultimate ran on it without any problems. With a 1,83 GHz Core 2 Duo processor and 4GB of RAM it is still a very good device to use. Also one of the reasons I choose the NC6320 for, is the 15″ display running a resolution from 1400×1050. Very helpful if you use Autodesk AutoCAD now and then. The increased need for mobility forced me to look for a (sub)notebook smaller formfactor. Since there are a large amount of options in the netbook-segment I evaluated them first, but a 10″ screen and a good uality keyboard were must haves. So I came up with the MSI Wind, Asus EEE 1000, Acer Aspire One A150-Bb and the HP 2133 MiniNote. It all are very portable devices, but I miss the 1400×1050 resolution for mechanical design. Furthermore I wanted to tackle a different “problem”. As a student I take a lot of notes, especially on masterclasses and workshops. The problem is you end up with a pile of paper, or you have to digitize them by making a short summary in Microsoft Word. James Kendrick of jkOnTheRun is an evangelist of the TabletPC for quite some time, so I compared the netbooks mentioned above with some TabletPC’s. At the end of the funnel one product out-performs the other devices in terms of build quality, power, screen, and another important parameter price. With the recent launch of the Lenovo X200 tablet, the Lenovo X60 tablet became at a very interesting price point. The Lenovo X60 tablet has a 12″ display running 1400×1050, which is my preferred resolution. Second the Lenovo X60 tablet really shows quality and robustness. The magnesium casing gives a great finish to the product, and contributes to the overall quality. The 1,6 GHz Core 2 Duo processor contributes to a good battery life without compromising the overall performance. With build-in bluetooth and WiFi the Lenovo X60 tablet has everything I need. The Lenovo Engineers thought well about details. For instance when a SD card is inserted into the memory slot, the card is “locked” with a click, while a LED shows the read/write-activity on the SD card. Als the Lenovo system update software performs well. The device is instantly recognized and the device specific updates are downloaded and installed. I’ve been using this device now for a few weeks and Windows Vista Ultimate, as well as Office 2007 Ultimate are already more “inking-friendly” compared to the previous versions. One of the applications I use today is Grahl Software’s PDF Annotator. This is a great tool if you work a lot with PDF-documents. You can easily correct, or comment like you would do on the paper version. The application is clearly optimized for TabletPC use. In Microsoft Windows Vista, there is a panel / window avaialable which slides into the screen from the left. In this window you can start writing and the text is recognized and transformed into digital writing. On my PocketPC I used Phatnotes Caligrapher, with which I could write all over the touchscreen and not just in a predefined window. At this moment I’m testing one of two available software packages: (1) Evernote Ritepen; and (2) Phatware Pen Office. Evernote Ritepen is pre-installed on the Flybooks, and since I also use their note-application I started using this one. Until now the recognition is great, clear distinguishment between normal and capital charaters. Now I’m exploring the additional features of this software. Windows Journal is also a great piece of embedded software in Windows Vista Ultimate. It really enhances your creativity, drawing, writing, reviewing and sketching idea’s, thoughts or simply texts. Overall I’m really happy with the Lenovo X60 tablet. I would buy it again without blinking with my eyes. High build-quality and smart details are characteristics of this device.With a great batterylife this is my ideal portable travelmate while on the go. With my Huawei E160 HSDPA modem I can work from everywhere. Finally I’m really happy I can contribute to save the environment; Printed documents are really limited, since I capture and review everything on the Lenovo X60 tablet. If you are at a point of buying a new notebook, take a look at the wonderful world of a tablet pc !! 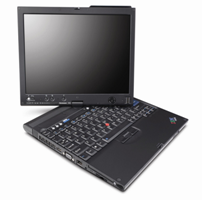 Hey!, I found this information for you: "Lenovo X60 tablet – A Windows powered tablet as primary “notebook”". Here is the website link: https://www.remo-knops.com/311/lenovo-x60-tablet-as-primary-notebook/. Thank you.